I have always been an oddly competitive person. Any sport, "Yeah I can do that, and you bet your bottom dollar I am going to try to be the best. No middle of the pack for me, Kid." (That's me pep talking myself). Thankfully, or maybe not so thankfully, I am a fairly coordinated person and most athletics come fairly easy to me, so I always did pretty well in competition. The problem goes so far beyond sports though. I am not 100% sure where I got this gene from as it manifests itself in both of my parents at times. We as a family found ourselves being competitive over the strangest things. Often these "challenges" or "games" ended in tears. For instance, do you know any family that aggressively plays Jeopardy at home and KEEPS SCORE? No? "That's really weird," you say? Well, now you know one family that did that... the Fitzpatricks. Dad never got in on the action, but Mom did. Oh did she ever. Of course she had 20 years on us, and a lot more schooling, so you can imagine how unfair this all was. We would yell out answers as Alex Trebek read out the clues. Oh you didn't respond in the form of a question? Sorry you can't have that point so I will take it because I said it correctly. We would hold up our fingers as personal scoreboards and compare where we were at during the commercial breaks. There was a lot of "Nah-uh" and "Yes-huh" shouting battles as to whether your score was accurate. Really it didn't matter though, because it came down to final Jeopardy anyway when you wagered it all! "Make it a true Daily Double, Alex!" (not the right context but I just like to say that). I can't remember a single time any of us beat Mom, but I do remember a lot of gloating when any one of us got a history question or one of those brain-teasing Before-And-After questions correct. Mainly it was Mom gloating about how far ahead she was of us (sorry Mom but it was your turn for embarrassment after I posted all those pics of the sisters. Love you!). As you can see from just this one example, the competition gene, that one that tells me don't do anything unless you are good at it, could have come from Mom. This recipe is all about protein and healthy fats. Got have both to stay fueled! Its not always all about carbs, people! 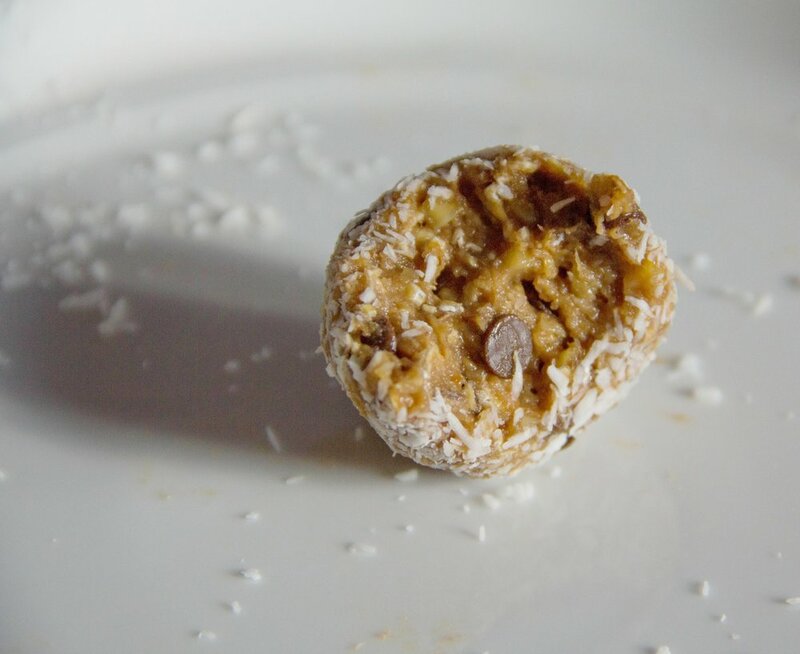 These protein balls (or bliss balls, as some may call it) are filled with different textural and flavor components to keep things interesting. There are cashews and flax seeds, peanut butter and apple sauce, oats and chocolate chips, and of course protein powder. Feel free to add anything else you might want to these... almonds, chia seeds, dried fruit... the key is to keep them wet enough to form into balls, but dry enough to keep their shape. You may have to play with the amount of oats or peanut butter to get it just right if you add more stuff, but don't be afraid!! You can't mess these up.